Founder of Mothers Always Write, an online literary magazine about motherhood, Julianne Palumbo is no stranger to its emotional territory. A prolific poet, essayist, writing coach and mother, she clearly hits her stride when writing about her children. 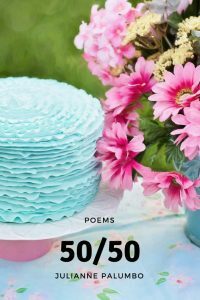 “50/50” is a seamless stroll spanning early motherhood to empty-nesting, woven on the warp and weft of turning 50. The parallel unknowns of parenting and aging are implicit in the construction of the collection. While every poem felt familiar to me as a(n aging) mother of three, some held such emotional resonance I found myself holding my breath. Then, throughout the next 30 pages, she indeed lets us look back with her at the many ways she might measure her worth: in love, compassion, wisdom, humor, and acceptance. 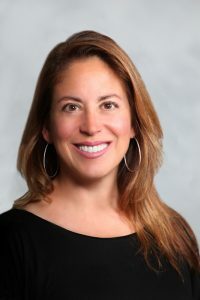 Along the way, she leads us through her own process of rationalization, denial, and ultimate acceptance of the shift involved in letting our children go into the world (“Sunset,” “The Scale,” “Fifty Something,” “Knowing Prayer,” and “Grown Children”) – all part and parcel of her own aging experience. my time, my attention, my teaching. I love the suspense and the conclusion; and in particular, that familiar sense of mother and daughter sharing a (different) moment of learning through the same experience. This is the final poem of the collection. While it ends on a wistful note, it is neither maudlin nor self-pitying. Rather, this simple reflection layers fond memory upon present acceptance to create just the right balance. The same balance created by the inclusion and progression of poems Palumbo selected for this collection. It would be difficult to read this collection as a mother and not find deep resonance and connection. For this, I thank the poet. She has succeeded in crafting sentiments so challenging to capture, let alone express, in simple heartfelt lines. Sarah Bartlett’s work appears in Adanna, the Aurorean, Minerva Rising, PoemMemoirStory, Mom Egg Review, Ars Medica; anthologies including the award-winning Women on Poetry (McFarland & Co. Inc., 2012); and two poetry chapbooks (Finishing Line Press). Her work celebrates the human spirit across moods and landscapes. She writes with Vermont’s incarcerated women to encourage personal and social change within a supportive community she founded in January 2010 (www.writinginsideVT.com); and co-edited Hear Me, See Me: Incarcerated Women Write (Orbis Books, 2013).